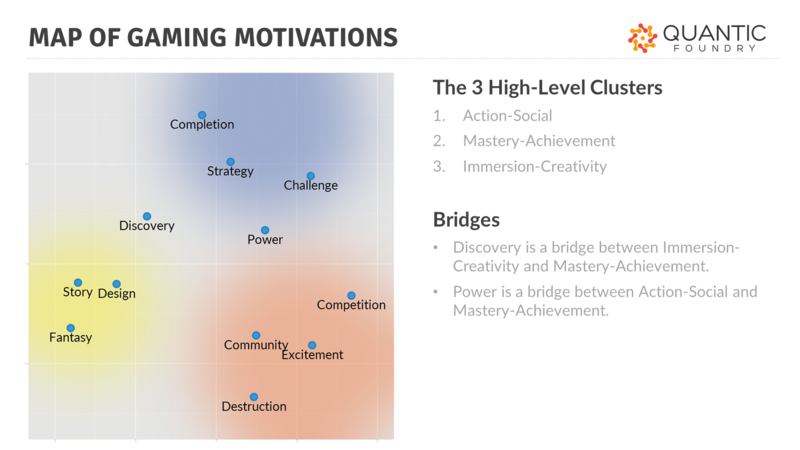 In our last blog post, we presented a visual clustering of gaming motivations based on data from over 140,000 gamers, showing how they group into 3 high-level clusters. Here’s that map again below for ease of reference. 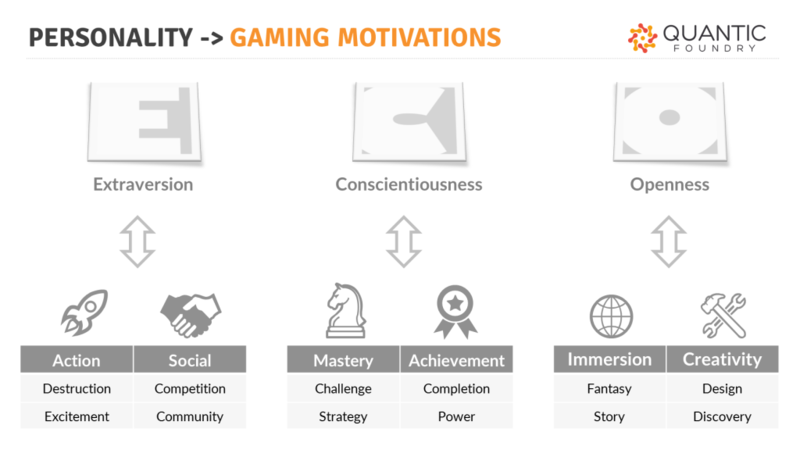 In this post, we’re going to explain the unintuitive Action-Social cluster and show you that gaming motivations are expressions of key personality traits. Bartle’s Player Types puts Community and Competition in different quadrants: pro-social interactions appeal to Socializers while competition appeals to Achievers. In Bartle’s model, the need for Excitement isn’t stated. In the Player Experience of Need Satisfaction (PENS) model, pro-social interaction is captured by Relatedness, but neither Excitement nor Competition are explicitly articulated. Previous models using factor analysis have often isolated the factors of Excitement, Community, and Competition (such as in Hilgard’s model or Sherry’s model), but these papers have not suggested any interesting relationships between these factors. The Action-Social cluster is unintuitive and hasn’t been proposed by any existing model. In the field of personality psychology, analysis of survey data has consistently found that personality traits cluster into 5 high-level factors, known as the Big 5 Personality Factors, and are consistent across different cultures. These factors are Extraversion, Conscientiousness, Agreeableness, Neuroticism, and Openness to Experience. We’re going to focus on Extraversion first. In popular culture, Extraversion is often reduced to a notion of being outgoing or reserved. And this is indeed one of the key underlying differences between Extraverts and Introverts. But personality research has found that a constellation of related traits underlie Extraversion. Apart from the need for social interaction, Extraverts also crave excitement and sensory stimuli, are energetic, tend to be cheerful, and often assertive (or even domineering) with others. Personality research has found that a constellation of related traits underlie Extraversion. This is where the Action-Social cluster comes from; it’s the expression of Extraversion in a gaming context. This is why we see a clustering of excitement-seeking, gregariousness, interest in guns and explosions, and social assertion in the form of competition. Let’s consider two other factors in the Big 5 Model. Conscientiousness is the tendency to be organized and disciplined (as opposed to being spontaneous and carefree), and Openness to Experience is the tendency to be curious and imaginative (as opposed to being practical and routine). Here, the mapping to the gaming motivation clusters is a little more obvious. The Mastery-Achievement cluster (focused on long-term goals and planning) maps to Conscientiousness, while the Immersion-Creativity cluster (focused on fantasy and discovery) maps to Openness to Experience. Gaming motivations not only map conceptually to personality traits, a gamer’s offline personality is actually aligned with their gaming motivations. Alongside the Gamer Motivation Profile, we also provided a separate Big 5 personality assessment tool. Thus, for the gamers who completed both profiles (N = 1,134), we were able to analyze the correlations between their offline personality traits and their gaming motivations. We found significant correlations between offline personality traits and gaming motivations. So gamers who score higher on Extraversion tend to score higher on Action-Social. And gamers who score higher on Openness tend to score higher on Immersion-Creativity. The relationship between Conscientiousness and Mastery-Achievement also had partial empirical support. We found significant correlations between offline personality traits and gaming motivations. What About the Other Two Big 5 Factors? Perhaps some personality traits haven’t been well-articulated as gaming mechanics and motivations in the current gaming market. I.e., they are gaming motivations waiting to be tapped. Alternatively, there isn’t a reason why every personality trait has to have a gaming expression. Perhaps some personality traits don’t make sense as a gaming mechanic or motivation. And finally, perhaps we didn’t cast a wide enough net of motivations to test in our model. For example, see Jason Vandenberghe’s Domains of Play model on his ideas of how these traits may express themselves in a gaming context. Games are often stereotyped as escapist fantasies—where people get to pretend to be something they’re not. But what the data shows is that gamers play games that align with their personalities. In the same way that people select the news and media that reinforce their worldviews, gamers select the games that reinforce their identities. For example, gamers who are extraverted prefer more social and action-oriented games. Gamers who are more conscientious prefer games with long-term thinking and planning. The games we play are a reflection, not an escape, from our own identities. In this sense, people play games not to pretend to be someone they’re not, but to become more of who they really are. Horror games seem like they’d fit with Neurotic personalities and I don’t think they really fit with any of the gaming motivations. Relaxing games such as Animal crossing & Simulators seem like good games for the agreeable types. Again not a perfect fit with any of the gaming motivations, more a hobby/past-time thing or Submission as they call it in the MDA framework. Kieron raises a good point. I play horror games because I enjoy them and to a certain extent help to reflect the sneaking sense that yes, everyone is out to get me! That’s more paranoia rather than neuroticism. Proper horror (not action RE4 style horror) appeals to my introversion/neuroticism as it relies on imagination and a terror of the worlds within us being made tangible (Silent Hill with its themes of guilt and loss). As I’ve aged my taste in gaming has shifted away from things requiring hours of work for progress and achievements to story heavy games exploring different views and perspectives (particularly around mental health). I have been doing your questionnaires for years, ever since someone linked one into guild chat in WoW, and it is fascinating to read the results. Thanks. Have you seen this player (user) type model from the UK? It defines antisocial behaviour as “disruptors”. Might be interesting to add to your thinking. Thanks for the paper link, Lindy! Definitely an interesting extension of Bartle’s work. Like Kieron and ShoeboxofM, that was my initial thought as well, but global neuroticism isn’t likely to relate to many games. If that trait was broken down into facets, that is likely where you will find some relationship between being neurotic and liking horror games. I also think that the horror genre is more likely to be an interaction between several traits rather than nicely aligning with a single trait.